I had better start at the beginning, which is when I first met Mr Geoffrey Weller. He was my metalwork teacher when I first went to Albury Manor County Secondary School at Merstham Surrey in 1957 aged 11years. He was always called Sam (something to do with Charles Dickens and The Pickwick Papers) and was an ex RAF flight engineer who flew in Lancaster bombers during the Second World War. After the war he trained to become a mathematics teacher but early in his career he was asked by the headmaster to teach metalwork as he had an interest aero modelling and at that time the school was unable to recruit a qualified handicraft teacher. During my first year at school pupils doing metalwork were engaged in making typical metalwork type jobs like name tags etc that were very boring. During our second year we were engaged in making a steam engine that I suppose was the AM Mk1. It was made with a wooden base that was painted and had a sheet of tinplate screwed on top to give it some protection from the heat and oil that it would be subjected to. The engine itself was made of brass and was mounted on a wooden block that was also painted. The main engine component piston, cylinder, crankshaft, flywheel ,burner and firebox were as on an the later designed AM Mk4 engine which instead had a cast aluminium base with a built in engine mount. Having completed the steam engines pupils were allowed to make items of their own choice and much model engineering was performed, making steam powered boats, steam turbines, steam powered fire engines as well as internal combustion engines for model aircraft. I left Albury Manor School in 1963 and continued in education finally qualifying as a teacher in 1969. 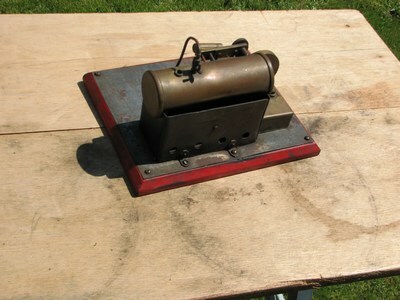 During the time I was at college Mr Weller redesigned the steam engine and wrote an article for the Model Engineer magazine explaining the AM Mk4 engine and how to build one. During the years I was at college Mr Weller moved house and was now living in Horley Surrey. He had also taken the job of head of the craft department at a newly opened school in Horley called Court Lodge Comprehensive School. Court Lodge School was a rapidly expanding school and when there was a need for another handicraft teacher Mr Weller persuaded me to apply for the job. I was fortunate enough to be appointed and began working with him as a colleague making AM Mk4 engines as the first job that boys doing metalwork had to make. In the mid 1970’s the cost of producing the AM Mk4 had risen to the point where it was becoming too expensive for the boys. Also about this time schools were being encouraged to switch to using metric dimensions. This was when the Court Lodge Mk1 engine was designed. Mr Weller and myself redesigned the engine based on the AM Mk4 but making it smaller, easier and quicker to build. It had only one long screw to hold the boiler and firebox onto the base instead of three brackets and seven screws. During the early 1980’s school numbers declined, Mr Weller retired from teaching and I took over as head of department. Soon it became necessary for girls to also do metalwork (Equality and all that) and girls proved not to be at all interested in making model steam engines so the manufacture of the CL Mk4 declined. In 1989 the two secondary schools in Horley merged to become Oakwood School and I was appointed head of department, a post I held for a number of years. I am now retired from teaching but still work at Oakwood as the DT technician. I still meet some of my old pupils from Court Lodge (They are the parents of the students at Oakwood) and many still have their steam engine of which they are very proud . Some of the students at school have found out that I used to build these engines and are trying to persuade me to let them build one. Albury manor school closed in the late 1970’s and the buildings are now used for a special school called St Nicholas. Both Albury Manor and Court lodge schools achieved having over 1000 pupils during the 1970’s so I guess that at least 100 engines per year were built during these years. Alas Mr Weller died about six years ago after suffering a massive heart attack just after celebrating Christmas with his family. I and many of my friends from Albury Manor School attended his funeral. Any further information needed give me a call. Roger later sent me some photos of a very early version of the Albury Manor engine. The main difference is that the base and engine frame are made from sheet metal and wood instead of being cast. The maker of this particular example also modified the design slightly from the original by adding a tap to control the speed, a superheater, a long main bearing for the crankshaft and he removed the rim at the base of the burner.